This all new hybrid scooter is a perfect fit for recreational or urban personal transportation. The Berylline F2A scooter is engineered for comfort, stability, and economy wherever you want to go. 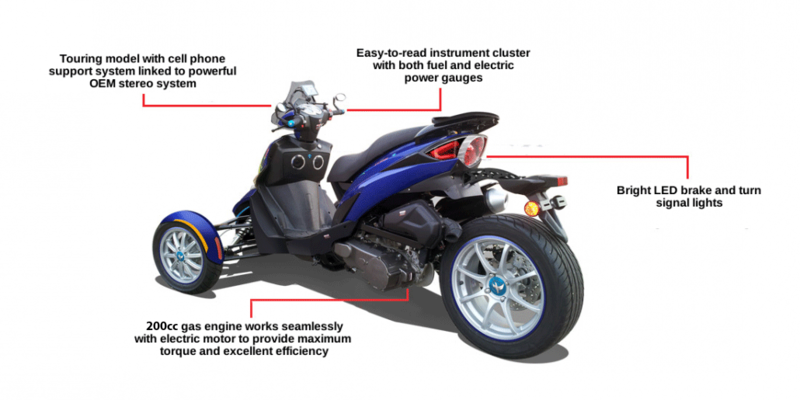 It features a fuel injection 200cc engine/2KW AC motor with a regenerative braking system and removable battery. The touring model also features a dual speaker stereo link to a dash-mounted smart phone support system, windshield and removable rear storage trunk. The F2A hybrid is designed for 2 passengers and luggage with capacity of 300 pounds. It has two front wheel and one rear wheel design. This provides an extra measure of stability and comfort over conventional, two-wheel scooters. It delivers a more comfortable and secure riding experience, especially for those new to scooters. The front suspension is engineered for easy, no-tip turning, and upright seating position. With a seat height of 27 inches and a weight of only 450 pounds, the new Berylline F2A hybrid scooter will give you a great riding experience. Berylline hybrid scooter is a PHEV(Plug-in Hybrid Electric Vehicle). Its unique and patent pending parallel hybrid system allows gasoline engine and electric motor to work together for optimum fuel economy and overall improved performance. 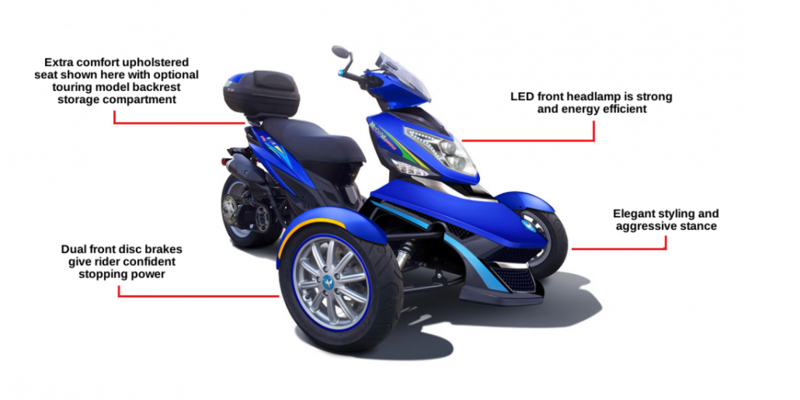 The estimated EPA mileage for Berylline hybrid scooter is 100 MPG. In the EV mode, the F2A has a top speed of 30 miles per hour and a range of 12 miles (Tour model). In the Hybrid mode, the scooter can achieve a top speed of 60 miles per hour and an optimum range of 160 miles. Berylline reserves the right to modify the specifications without notice.